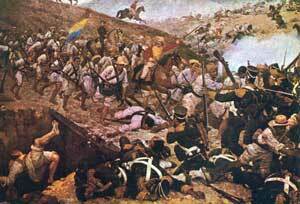 Battle of Boyacá Day always occurs August 7th. It marks the Battle of Boyacá on 7 August 1819 which was a very important victory in the independence war against Spain. Parades and festivals throughout Colombia mark the celebration of this holiday. The military will pay their respects to those who died in battle as well. This holiday originated when Brigadier Generals Francisco de Paula Santander and José Antonio Anzoátegui led their combined armies to control the wanted town of Boyacá. They did it in 2 hours and it created a path to independence for Colombia.